“Save 10,000 Toes,” a campaign to prevent toe amputations through health services in Fiji, Vanuatu, Solomon Islands, Samoa, American Samoa, Kiribati, and Tonga. Construct Hope TV and radio studios in Tongatapu, Tonga. The narrator doesn’t need to memorize the story, but he or she should be familiar enough with the material so as not to have to read it. The hot Amazon sun made their work exhausting. 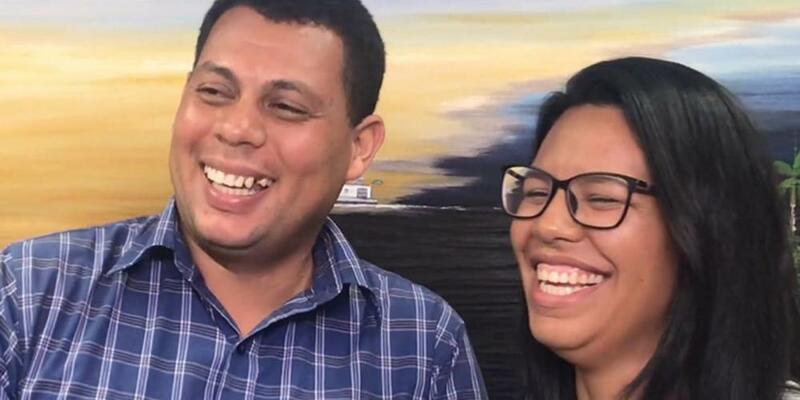 Pastor Reno and his wife, Natalia, docked their boat at the remote Brazilian village of Democracia and knocked on the doors of every home to distribute invitation cards to evangelistic meetings. Then the missionaries walked 45 minutes along a muddy road to another village, where they also visited every home. Three Bible workers helped them by visiting homes in two other villages. The missionaries did this every day during the month-long evangelistic series at an open-air community center in Democracia. People flocked to the meetings, many riding in the back of three rented battered pickup trucks secured by the missionaries. Other people walked. But few Democracia villagers joined the daily gathering of 150 people. As the meetings entered their second week, Reno and Natalia grew weary. The long morning walks and the villagers’ apparent indifference discouraged them. Some people grumbled that the couple resembled door-to-door salespeople with their daily visits. Others looked suspiciously at a rising Adventist church building that Reno had hired workers to construct. The villagers belonged to a single Sunday denomination, and they spoke with worry about how families had been split in a neighboring village when a rival Sunday denomination had entered that community. They didn’t want division in Democracia. After one particularly tiring day, Reno and Natalia collapsed on their boat. “That’s our answer!” Natalia exclaimed. The next day, a middle-aged woman cried out with joy when Reno and Natalia stopped by her home with an invitation card to the evangelistic meetings. The missionaries learned that the woman had watched Novo Tempo television, the Brazilian affiliate of Hope Channel, for the past four years and prayed for a preacher like those on the channel to come to her village. The woman was among 50 people baptized when the meetings ended in December 2017. Also baptized were two sisters, Franciene, 19, and Delciene, 16, who began attending after the missionaries read the Bible promise. The sisters’ parents forbade them from going to the meetings, but they went anyway. As he listened to the sisters speak about their newfound faith, Reno remembered his own discouragement just weeks earlier. The villagers, who had worried that a new church might create a rift, ended up changing their minds. “Wow, this is a different kind of church,” said one. “You care for us and don’t want to divide the community,” said another. Democracia was the last site of three evangelistic series organized in 2017 by Reno, pastor of the Amazonia de Esperanca (Amazon of Hope) boat church, a 2016 Thirteenth Sabbath project. Reno baptized 286 people and planted three churches in 2017, the boat church’s first full 12 months in operation. The boat — which has a meeting hall with air conditioning, a projector and sound system, and seats for 150 people — travels to remote villages along the Amazon River. While an especially muddy shoreline made it impossible to use the boat for the Democracia meetings, the boat was used for the other evangelistic series. After Democracia, Reno and Natalia, both 32, are convinced that discouragement has no place in the Adventist work. The couple expressed gratitude to church members around the world for contributing to the purchase of the boat church through the Thirteenth Sabbath Offering in fourth quarter 2016.